HÀ NỘI — The northern city of Hải Phòng wants to open another cross-sea bridge parallel to Tân Vũ – Lạch Huyện Bridge connecting the eastern part of the city with Cát Hải District. At a government e-meeting on Monday, municipal People’s Committee Chairman Nguyễn Văn Tùng asked the Government for permsission to spend about VNĐ7 trillion (US$305 million) from the city’s budget to build the second bridge. Tùng said that the second bridge was needed to help reduce pressure on the first crossing to Cát Hải District, which was developing strongly resulting in increased travel demand. The first cross-sea bridge opened last September but was overcrowded and failed to meet travel demands to the district, which is home to Lạch Huyện International Port and the Vinfast Automobile Manufacturing Factory, he said. “Hải Phòng wants the Government, relevant ministries and agencies to study and approve the project,” Tùng said. He also proposed a power station project in Cát Hải to meet the demand of industrial production and tourism, as well as a project to build a second terminal at Cát Bi International Airport. At the meeting, Prime Ministry Nguyễn Xuân Phúc applauded Hải Phòng for developing its urban area, industry, services and rural transport. The Tân Vũ-Lạch Huyện Bridge, Southeast Asia’s longest cross-sea bridge, was opened last September. 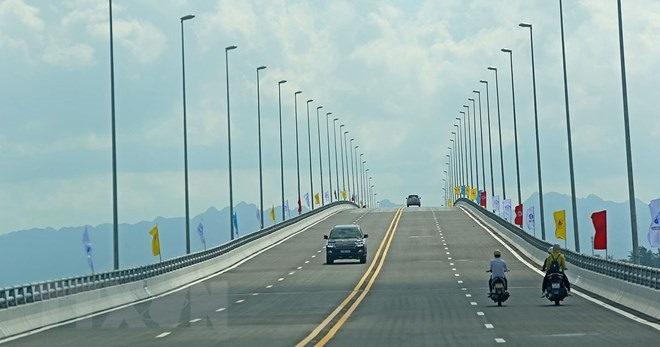 The 5.4km-long bridge is part of the Tân Vũ-Lạch Huyện Highway project, which connects developing areas in the east of Hải Phòng with Lạch Huyện International Port in the island district of Cát Hải and the Hà Nội-Hải Phòng Expressway.